In 1960 when questions about John F. Kennedy’s religion came up, he gave a speech to the Greater Houston Ministerial Association. Although given 50 years ago, it still seems it should apply to politics today. I wish it would. 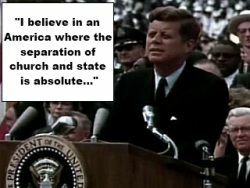 This entry was posted in Entanglement, Politics, Positive, Religious Intolerance and tagged 1960, 1st amendment, atheist, Catholic church, church and state, civil rights, Freethought, Greater Houston Ministerial Association, President John F. Kennedy, Protestant on September 5, 2011 by Doug. 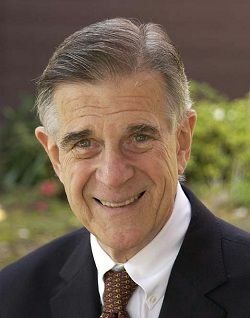 Some good news to report from the US General election, Pete Stark (D-13) of Fremont California, the only openly atheist member of Congress was re-elected Tuesday night. So we got that. Democrat Pete Stark, a 19-term incumbent, won by 70.9 percent with all precincts reporting, compared with 28.2 percent for Republican Forest Baker and write-in votes of 0.9 percent. An independent candidate, Chris Pareja, was running as a write-in in the race. This entry was posted in Politics, Positive and tagged 2010 election, atheist, church and state, Congress, Pete Stark, Secular Coalition for America on November 3, 2010 by Doug. I found this the other day and thought I would pass it on. I happen to agree with the Copenhagen Declaration on Religion in Public Life 100%. I encourage you to read and consider the points. The recent Gods and Politics conference in Copenhagen adopted the following Declaration on Religion in Public Life. The conference was the first European event of Atheist Alliance International, and was co-hosted by AAI and the Danish Atheist Society. * We recognize the unlimited right to freedom of conscience, religion and belief, and that freedom to practice one’s religion should be limited only by the need to respect the rights of others. * We submit that public policy should be informed by evidence and reason, not by dogma. * We assert the need for a society based on democracy, human rights and the rule of law. History has shown that the most successful societies are the most secular. * We assert that the only equitable system of government in a democratic society is based on secularism: state neutrality in matters of religion or belief, favoring none and discriminating against none. * We assert that private conduct, which respects the rights of others should not be the subject of legal sanction or government concern. * We affirm the right of believers and non-believers alike to participate in public life and their right to equality of treatment in the democratic process. * We affirm the right to freedom of expression for all, subject to limitations only as prescribed in international law – laws which all governments should respect and enforce. We reject all blasphemy laws and restrictions on the right to criticize religion or nonreligious life stances. * We assert the principle of one law for all, with no special treatment for minority communities, and no jurisdiction for religious courts for the settlement of civil matters or family disputes. * We reject all discrimination in employment (other than for religious leaders) and the provision of social services on the grounds of race, religion or belief, gender, class, caste or sexual orientation. * We reject any special consideration for religion in politics and public life, and oppose charitable, tax-free status and state grants for the promotion of any religion as inimical to the interests of non-believers and those of other faiths. We oppose state funding for faith schools. * We support the right to secular education, and assert the need for education in critical thinking and the distinction between faith and reason as a guide to knowledge, and in the diversity of religious beliefs. We support the spirit of free inquiry and the teaching of science free from religious interference, and are opposed to indoctrination, religious or otherwise. Please circulate this as widely as you can among people and groups who advocate a secular society. This entry was posted in Groups, Positive and tagged atheist, Atheist Alliance International, church and state, Copenhagen Declaration on Religion in Public Life, religious freedom on June 30, 2010 by Doug. 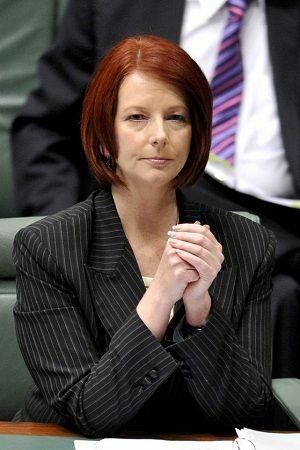 I was shocked when I learned that new Australian Prime Minister Julia Gillard doesn’t believe in God. This is why I need to live either in Europe or Australia since they aren’t hung up on their politicians and religion. What shocked me even more is she was quoted in an interview by the Australian Broadcasting Corporation (ABC) and it was made public. Good on her and Australia. *Update* After posting this entry I heard that PM Gillard is opposed to gay marriage. Below is a quote and link to a newspaper article that confirms her view. While I am happy that she is an atheist, there isn’t a valid secular reason to oppose gay marriage. Tax implications and protecting children are red herrings and have roots in religious bigotry. Prime Minister Julia Gillard says she does not support legalising gay marriage in Australia. “We believe the marriage act is appropriate in its current form, that is recognising that marriage is between a man and a woman, but we have as a government taken steps to equalise treatment for gay couples,” Ms Gillard said. Maybe one day we will have the perfect atheist elected official. This entry was posted in Politics, Positive and tagged atheist, Australia, Australian Prime Minister Julia Gillard, church and state, government, religious freedom, secular on June 28, 2010 by Doug. An actual official meeting at the White House will happen on Friday February 26th between representatives of non-theistic groups and President Obama’s staff. While not as splashy as a meeting with the President it is important for those of us non-believers who feel we were ignored during past administrations. Instead, several administration officials will sit down quietly for a morning meeting at the Eisenhower Executive Office Building on the White House campus with about 60 workhorses from the coalition’s 10 member groups, including the American Atheists and the Council for Secular Humanism. Tina Tchen, the director of the White House Office of Public Engagement, and representatives from the Justice and Health and Human Services departments will participate. The coalition doesn’t embrace all the Obama administration’s stances, but members think that they have more of a kindred spirit in the president than in his predecessor, George W. Bush. Obama once taught constitutional law. His late mother was spiritual but agnostic. His inaugural address is credited as the first by a U.S. president to include explicit recognition of “nonbelievers” as part of the fabric of the nation. Coalition members plan to use Friday’s meeting to advocate closing federal loopholes in the law that governs medical neglect. They say that officials in any state should be able to remove sick children who need medical treatment from homes in which parents believe in faith healing as easily as they could intervene on behalf of other children. This entry was posted in Groups, Politics, Positive and tagged atheist, church and state, godless, non-believer, President Obama, Secular Coalition for America, White House on February 26, 2010 by Doug. Tonight, 2/12, the Paula Zahn Now show finally offered up their response to the thousands of complaints from atheists about the bigotry expressed on the 1/31 show. It didn’t look like it would be a good show as Paula Zahn conveniently had the night off. John Roberts filled in for her and I thought he did the job she should have done on January 31 – challenge some of the comments from the panel. Peterson showed his stripes when he was asked about atheists and he called them “hypocrites”. This entry was posted in Lies, Media, Myths, Religious Intolerance and tagged American Atheists, atheism, atheist, civil rights, CNN, Paula Zahn on February 13, 2007 by Doug.